FTP Accounts cPanel section helps you to create and manage the File Transfer Protocol (FTP) accounts. 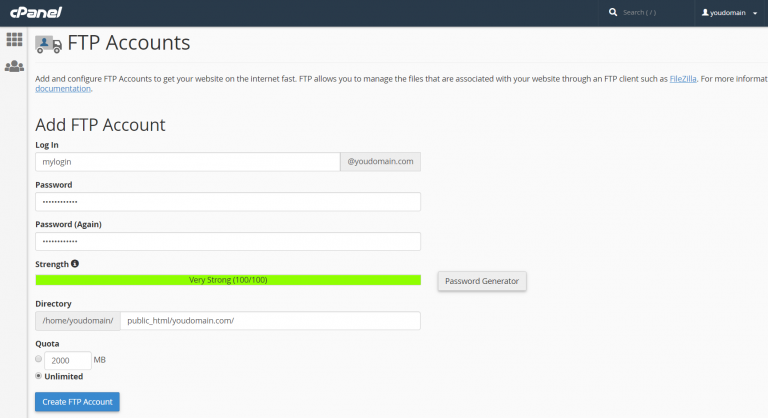 FTP allows to manage your website’s files. You can choose what directory the new account will have access to, and limit the space it can take up. 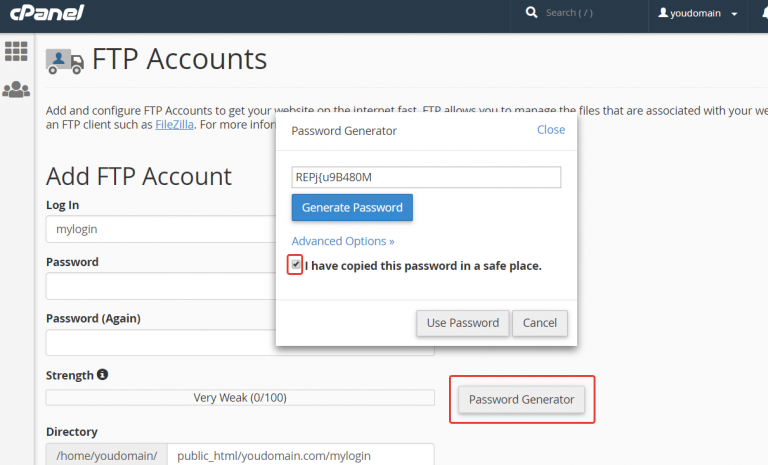 By default, you can use your cPanel’s account username and password to log into FTP. At the bottom of the FTP Accounts page, you can find your existing FTP accounts with the default account. Press Configure FTP client button for the chosen account to see manual FTP settings and configuration files for the most popular FTP clients. At the top of the FTP Accounts page you can create new FTP account. Enter the login information you’d like in a Log In box. If you have more than one domain attached to the hosting account, you’ll be able to change domain name to the account. The default access directory in Directory box will be automatically changed to the chosen domain’s directory. Copy your password to a safe place and press the checkbox to make a Use Password button active. The Directory box defines the new FTP account’s highest level of directory access – the top level they can edit. Also you can set a maximum quota for the space the new FTP user can take up. This value be a limited or unlimited (this option means all amount of your disk space). Press Create FTP Account button to save your settings.